One of two telephones used by Alexander Graham Bell in a demonstration that took place between Boston and Salem, Massachusetts on November 26, 1876. Critical features are the iron diaphragm (seen as a black circular disc mounted on the vertical wooden support), two electromagnets (seen in white, facing the diaphragm), and a horseshoe permanent magnet (lying horizontal, pressed against the electromagnets). When the device is used as a transmitter, sound waves at the mouthpiece cause the diaphragm to move, inducing a fluctuating current in the electromagnets. 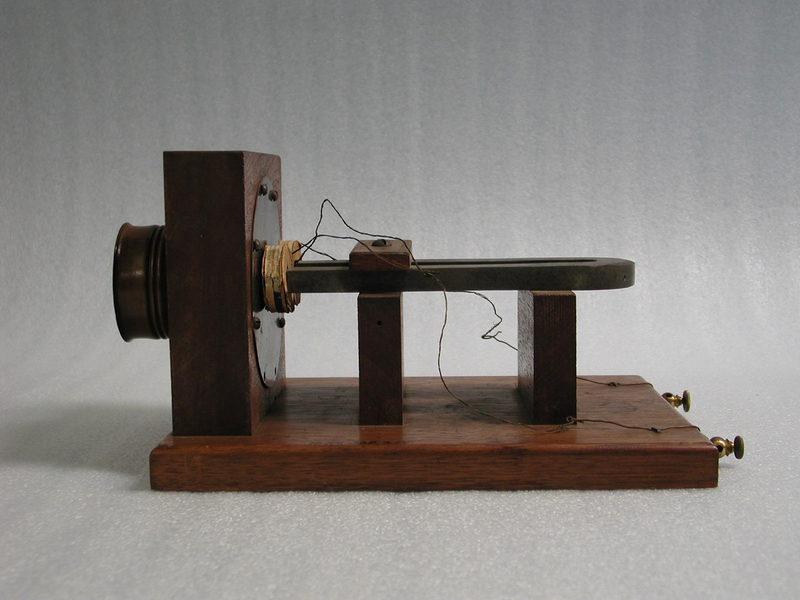 This current is conducted over wires to a similar instrument, acting as a receiver. There, the fluctuating current in the electromagnets causes the diaphragm to move, producing air vibrations that can be heard by the ear. This was a marginal arrangement, but it worked well enough to provide the first commercial services in 1877. The magnetic receiver continued to be used, but the transmitters were soon replaced by a carbon variable-resistance device designed by Francis Blake and based on a principle patented by Thomas Edison. “Alexander Graham Bell's Large Box Telephone,” Digital Public Library of America, http://dp.la/item/f4f399efea7f05c96a4cead4f954d3d4.